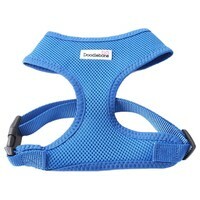 Made from a softly padded, breathable air mesh fabric, the comfortable design of the Doodlebone Airmesh Dog Harness puts no strain on your dog’s neck and has been double stitched for extra strength. Super strong and super soft, the harness ensures your dog is as comfortable as possible by spreading their weight across their chest evenly, and preventing chafing and strain on their legs and joints. The harnesses are adjustable with strong plastic buckles and have a large solid D ring for attaching your lead to.